- EASILY FULL BODY WORKOUT: Hundreds of GYM exercises with one simple FUSION CLIMB Portable PRESTO X FIT GYM system to build muscles and to burn fats. Easily workout for upper body or lower body training. 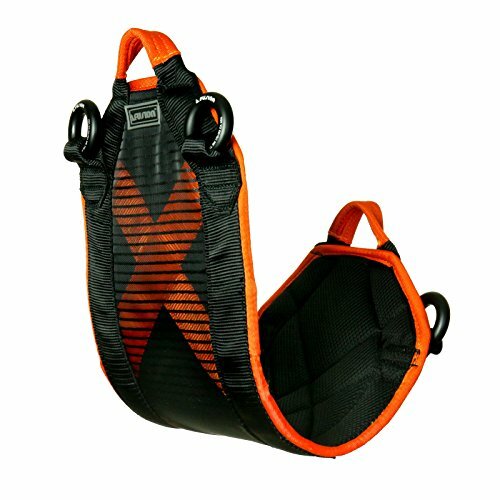 - PORTABLE AND PACKABLE: Various FUSION CLIMB Portable PRESTO X FIT GYM system let you practically create your own professional Yoga, Trapeze, Pilates, CrossFit, Weightlifting, Traction or Dance Workout Setup on the fly anytime and anywhere. - QUICK AND EASY TO SETUP: The FUSION CLIMB Portable PRESTO X FIT GYM system is compact and lightweight, instant setup is achieved by quick anchoring on doorframes, rafters, ceiling beams, chin-up bars, poles, tree limbs, hooks, outdoor fixtures, anything that can hold up your pulling weight and possibilities of workout variations are limitless. The components are professional/commercial grade equipment and industry trusted brand Fusion Climb stands for its built quality. - RECOMMENDED TO USE: Aerial Yoga, Dance Workout, Theatrical Performance, Trampoline Applications, Suspension Training, Resistance Exercise, Medical Rehabilitation Support, General Fall Protection. - WARRANTY: ALL FUSION CLIMB PRODUCTS ARE BACKED BY 12 MONTHS FACTORY WARRANTY.